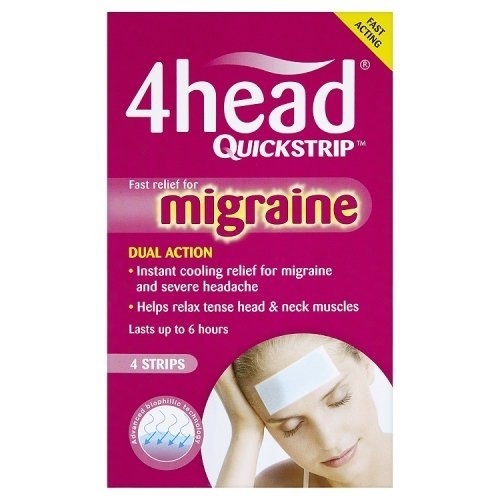 Fast, dual action relief for whenever migraine or severe headache strike. How does 4head QuickStrip work? Make sure the skin is dry before applying the QuickStrip, and avoid contact with hair, clothing and fabrics (otherwise the strip will not stick very well). Open the resealable sachet by carefully cutting or tearing it where indicated at the top. Remove one 4head QuickStrip, then fold the top of the sachet twice to reseal it (and prevent the remaining strip from drying out). Remove and discard the transparent film from the back of the strip. Apply strip and use for as long as needed. For best results, use each strip only once. If irritation occurs, apply the strips less frequently or for shorter periods. If irritation becomes unacceptable, stop using the strip.